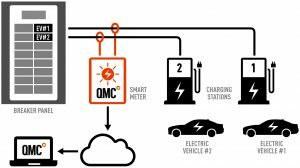 The Electrical Vehicle (EV) charging station for each parking stall is monitored by a Measurement Canada approved QMC smart meter. The meter is located beside the electrical panel that has an individual breaker for each EV receptacle. 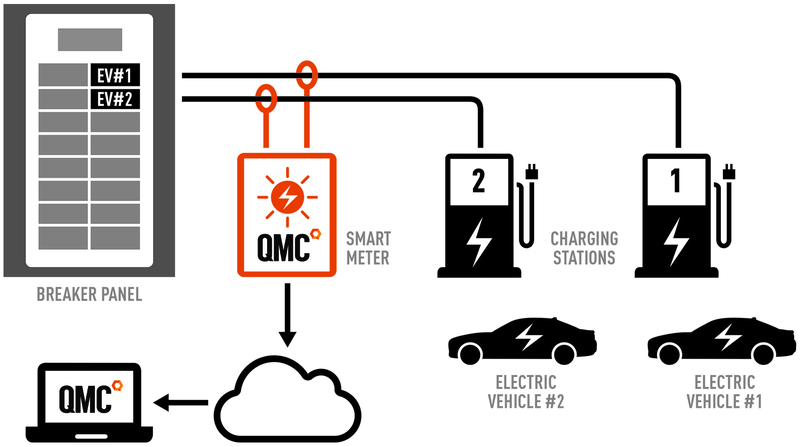 Each meter is connected to the building network with internet access, for immediate, accurate reporting on all EV energy use. All related services, such as contractor coordination, verification, etc. The smart meter data is pushed to the MeterConnex platform on a daily basis. A property manager can then use this data to make cost allocation reports, including a charger per kWHr, meter fee (if applicable) and PST/GST if required. These reports can be generated for individual tenants, or for the entire property, and downloaded in Excel, CSV or pdf format. Tenants and property managers are each assigned an account with a unique login to access the system. Tenants can use their accounts to view their EV charging electrical consumption history and costs on QMC’s Trak&Save portal. The portal provides all information on EV charging costs, including time charged on a daily, weekly, monthly, and annual basis. If users are being charged for electricity, then electric vehicle charging station meters must be Measurement Canada approved. QMC is a Measurement Canada accredited meter services provider. At our Coquitlam and Toronto test labs, we provide Measurement Canada approved meter sealing.